It was excellent that this always enjoyable Club tour was reinstated this year, with the golfing hockey players arriving early - it was considered that at least two of the East Over 65s players, who have been on the tour for many years, might have been under instructions to keep fit for the EH Cannock tournament the following weekend, so their attention was particularly drawn to golf for fitness training, followed by cream teas as an aid towards stamina training. The tour really started on Friday at the Gradees Restaurant in St. Helier with an excellent meal, a short walking distance from the team’s headquarters at the Mayfair Hotel. On Saturday after a morning’s free time around Jersey, the squad assembled at the Quennevais Leisure stadium pitch at 3.00pm, in lovely sunny conditions. It was against the run of play that two LX Club defence lapses resulted in Jersey going 2-0 ahead very early in the game, but Alan Jackson, always skilful in defence, and Alan Dures in goal, kept the score at this level until half-time. Following a spirited team talk by maestro Captain John Longden, the LX Club took control of the game with the LX forwards becoming more dominant, especially with the rotation of Hugo Rowbotham, Roger Lomas and Brian Woolcott on the wings. David Read (Worcestershire) combined well with Graham Martin and Richard Clarke, resulting in the latter scoring a lofted goal over Tim Pollard (LX Club member) in the Jersey goal. Despite further LX pressure the game ended in a well deserved win for Jersey 2-1. After this the two teams adjoined to the ‘La Marquanderie’ Inn, prior to a superb dinner in the Bistro Soleil at Beaumont St. Peter, attended by several of the Jersey HC veterans, who were thanked by John Longden for their supportive attendance. On Sunday 9th May the LX Club team raised their game to try and achieve a positive result. It was highly encouraging when Graham Martin, following passes from Adrian Robertson and David Read (Worcestershire), scored first for the LX Club. However, in the spirit of the Liberation Day celebrations for Jersey and the other Channel Islands, Jersey quickly moved into a 4-1 lead at half-time, aided by their slightly younger forwards. After half-time, Jersey reorganised their team which then gave the LX Club an opportunity to reform. Goals quickly followed from Adrian Robertson (2), Brian Woolcott (1), thereby getting the score to 4-4, with Hugo Rowbotham moving back to his more accustomed role in defence. LX Club moved ahead with an excellent reverse stick shot from Graham Martin, but Jersey were not to be denied, and in the final minute, equalised from a penalty corner to make the game all square at 5-5. The after-match analysis took place at the ‘La Marquanderie Inn. All agreed that this is a fixture which must be maintained for the enjoyment of the members of both Clubs. No tour of this nature would be complete without a mention of a LX Club Member Match Organiser. Once again, so many thanks to Tim Pollard, ably supported by his wife June, and for the hospitality which they laid on in their home on the Sunday evening. The LX Club also thanks the contribution made by the three umpires, who were Peter Taylor (2 games), and Neville Benbow and John Roberts. 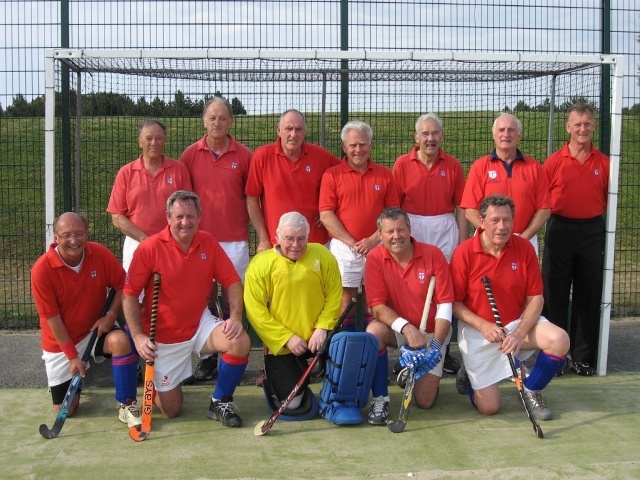 LX Club Team: Alan Dures, John Longden (Captain), George Hazell, David Read (Sussex), David Read (Worcestershire), Adrian Robertson, Hugo Rowbotham, Alan Jackson, Brian Woolcott, Graham Martin, Richard Clarke, Roger Lomas. Final thanks go to all the wives who supported the LX Club (and did some shopping along the way! ).